VIZ Media, LLC (VIZ Media), the largest distributor and licensor of manga and anime in North America, celebrates the triumphant return of the “Sailor Moon” anime series with a host of fun activities for Sailor Moon Day, taking place on Saturday, July 5, during the 2014 Anime Expo. North America’s largest anime convention, attracting more than 61,000 fans and attendees annually, the 2014 Anime Expo will be held July 3 to 6 at the Los Angeles Convention Center. Full details are available at www.anime-expo.org. VIZ Media will be located on the main convention floor in Booth 1601. VIZ Media marks its acquisition of the iconic fantasy anime series with a Sailor Moon Official Panel on Saturday morning at 10 a.m. in LP1. Hosted by the company’s senior manager of animation marketing, Charlene Ingram, and “Sailor Moon” Associate Producer Joshua Lopez, the panel will reveal for the first time the brand new cast for the freshly produced English dub and premiere the first two dubbed episodes. “Sailor Moon” fans attending this official panel will get a special premium poster while supplies last. Following the panel, there will be a special showing of subtitled Episode 1 of the all-new series, “Sailor Moon Crystal,” in Video 1 at 12 noon. The series launches on July 5 in Japan, and fans in the U.S. may catch the simulcast on www.NeonAlley.com and http://Hulu.com/sailormoon, with new episodes debuting each Saturday. Fans can also look forward to a special voice cast autograph session taking place at 1 p.m. in the afternoon in the Anime Expo autograph area, and a cast photo opportunity with the official Sailor Guardian Cosplayers from American Cosplay Paradise at 2:45 p.m. in the VIZ Media Booth. To round out the day’s activities, be a part of the largest gathering of “Sailor Moon” cosplayers and fans in North America at 3:30 p.m. in the Main Events Hall (LP1, Petree Hall). Bring your Sailor Guardian finest and you just might end up a part of an upcoming “Sailor Moon” video release. If you can’t make the official Sailor Moon Day activities on July 5, VIZ Media will also be running a special “Sailor Moon” event at their Anime Expo booth for the entirety of the convention. Find one of the official Sailor Guardian cosplayers at Booth 1601 for information on how you can get a limited premiere event memorial coin. 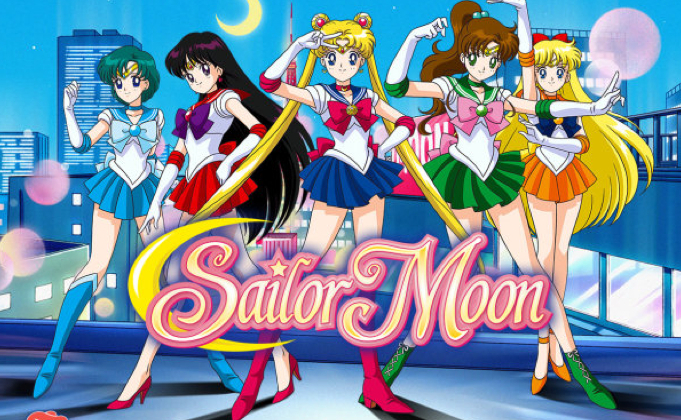 VIZ Media has licensed all five seasons of the original “Sailor Moon” anime series (rated TV-14), spanning 200 episodes, as well as all three feature films. Included is the long-running show’s fifth and climactic final season “Sailor Stars,” which has never before been licensed for North American release. As part of the return of the series, VIZ Media is producing a fresh and uncut English dub with an all-new voice cast, will present “Sailor Moon” for the first time digitally, and also plans DVD and deluxe Blu-ray edition sets for release in time for the 2014 holiday season. The smash hit anime series is inspired by the bestselling manga (graphic novel) series created by Naoko Takeuchi (published in North America by Kodansha). In the series, Usagi Tsukino is a clumsy but kindhearted teenage girl who transforms into the powerful guardian of love and justice, Sailor Moon. Meeting allies along the way who share similar fates, Usagi and her team of planetary Sailor Guardians fight to protect the universe from forces of evil and total annihilation. For more information on “Sailor Moon” or other anime titles from VIZ Media, visit www.VIZ.com/sailormoon. Headquartered in San Francisco, VIZ Media distributes, markets and licenses the best anime and manga titles direct from Japan. Owned by three of Japan’s largest manga and animation companies, Shueisha Inc., Shogakukan Inc., and Shogakukan-Shueisha Productions, Co., Ltd., VIZ Media has the most extensive library of anime and manga for English-speaking audiences in North America, the U.K., Ireland and South Africa. With its popular digital manga anthology Weekly Shonen Jump and blockbuster properties like “Naruto,” “Bleach” and “Inuyasha,” VIZ Media offers cutting-edge action, romance and family friendly properties for anime, manga, science fiction and fantasy fans of all ages. VIZ Media properties are available as graphic novels, DVDs, animated television series, feature films, downloadable and streaming video and a variety of consumer products. Viz is still not properly distributing the original anime into Canada. Viz is continuing to not properly distribute the original anime into Canada. That’s because of their contract with Hulu. Luckily, NicoNico saved this from happening to Crystal, which is why Canada can view it on Crunchyroll.